Solar Chem Roofing is proudly New Zealand owned and operated. 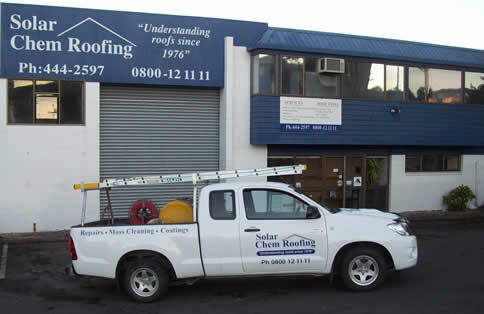 Founded in 1976, Solar Chem established the roofing resurfacing industry in New Zealand and continue to be industry leaders. Solar Chem design and manufacture protective coatings formulated from the highest quality polymers and resins for all roof substrates. Including Clay Tiles, Stone Chipped Tiles (Decramastic), Concrete Tiles and Coloursteel. We have done extensive work under maintenance contracts for Housing New Zealand, local councils, schools, churches and retirement villages throughout New Zealand. With thousands of roof maintenance, roof repair jobs, exterior cleaning, maintenance and resurfacing jobs completed over the last 38 years, we have the skills, the know-how and the track record to take care of your next roofing job. Understanding roof maintenance is our business. We originally contacted you due to a leaking roof, you were recommended by a work colleague who found your work very satisfactory when you did his roof. Our leak was fixed immediately & so far we are very happy with the work done on ours. We would happily recommend you to others. The roof on the house I am having renovated was obviously in poor repair, & your Company not only identified what needed to be done, but very quickly treated it, repaired it & completed the colour at a cost less than I had expected. I just hope the rest of the house will look as good when it is finished. I would like to thank all the Team at Solar Chem Roofing for the exceptional service from start to finish. My roof looks great! Service was prompt, professional & Staff were very friendly & helpful. I will recommend you to others with no hesitation. The whole experience from day one was seamless for us & the work was done quickly & efficiently without compromising the quality, quite the opposite. Our roof looks like new. We now feel comfortable with a roof that can withstand the next decade. The most competitive price & extremely happy with the outcome. Thank you Peter & his Team. We really appreciated the quick response to repair our storm damaged tile roof & ultimately the cleaning & repainting of the roof. Looks really good now job is completed. Great job, would & are using them on my next door house we have bought. We have just had two jobs done in the Bay of Plenty. All good. We like Vern: direct, genuine, honest, easy to talk to, and got things done quickly. Job was completed quickly, roof looks really good, love the colour. Thank you for the outstanding service & fantastic job your guys have done. The service & follow ups dating back to August 2013 (original quote) have been second to none. I will definitely be advertising your workmanship to friends & colleagues over the coming years. I have already given a mate your contact details. Our house looks totally different & we will really start to enjoy from here on in. Again, than you so much for what you have done. Exceptional service. Thorough, friendly, considerate & prompt.